Objective: In order to evaluate the inhibitory effects of isoniazid on cytochrome P 450 (CYP) mediated drug metabolism, the in vitro inhibitory potency and specificity as well as the reduced nicotinamide adenine dinucleotide phosphate (NADPH)-, time- and concentration dependency of isoniazid as an inhibitor of the activity of the major human CYP isoforms were studied. 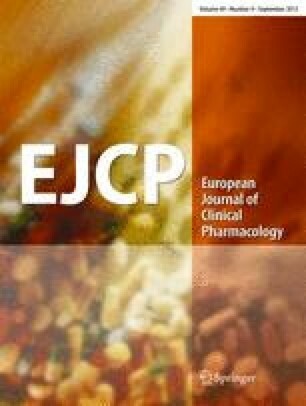 Methods: Using pooled human liver microsomes, the in vitro inhibitory effects of isoniazid on CYP1A2 (phenacetin O-deethylation), CYP2A6 (coumarin 7-hydroxylation), CYP2C9 (tolbutamide hydroxylation), CYP2C19 (S-mephenytoin 4′-hydroxylation), CYP2D6 (dextromethorphan O-demethylation), CYP2E1 (chlorzoxazone 6-hydroxylation) and CYP3A4 (midazolam 1'-hydroxylation) activities were examined. Results: After a 15-min preincubation without NADPH, isoniazid reversibly inhibited microsomal CYP2C19- and CYP3A4-mediated reactions with apparent K i values of 36 µM and 73 µM, respectively. However, isoniazid had only weak inhibitory effects on the five other CYP-mediated reactions (K i >110 µM). After a 15-min preincubation with NADPH, isoniazid showed an increased inhibitory potency toward CYP1A2, CYP2A6, CYP2C19 and CYP3A4 activities (K i =56, 60, 10 and 36 µM, respectively). In addition, the inactivation of CYP1A2, CYP2A6, CYP2C19 and CYP3A4 by isoniazid was NADPH-, time- and concentration dependent, and was characterised by K inact values of 0.11, 0.13, 0.09 and 0.08 min–1, and K I values of 285, 173, 112 and 228 µM, respectively. Conclusions: As the peak plasma concentrations of isoniazid are around 30–50 µM, isoniazid at clinically relevant concentrations reversibly inhibits CYP2C19 and CYP3A4 activities, and mechanistically inactivates CYP1A2, CYP2A6, CYP2C19 and CYP3A4 in human liver microsomes. Co-administration of isoniazid and drugs that are primarily metabolised by these CYP isoforms, particularly by CYP2C19 and CYP3A4, may result in significant drug interactions.